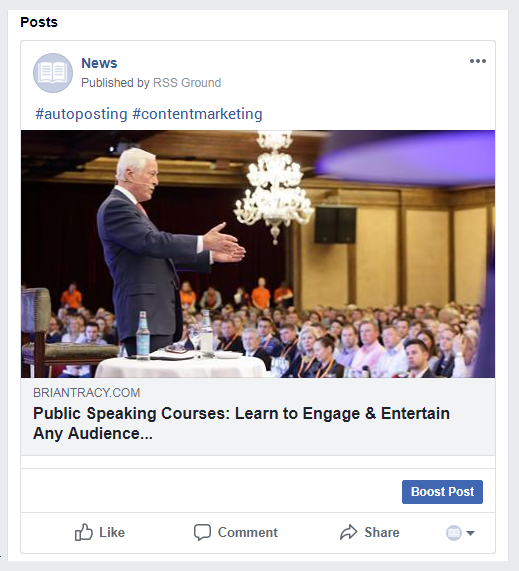 Facebook poster allows to automatically share content from content feeds to your Facebook fan and business pages, and to your Facebook public, private and secret groups. To start sharing content you need to set up a Facebook posting campaign. To be able to create a Facebook posting campaign you need to sign up for any of RSS Ground membership plans. You start creating your posting campaign with the addition of content feeds. You add them from Feeds Box, any of the content feeds generators or manually using "Add new feeds" > "Import feeds" option. First thing you have to do in Basic settings is to Authenticate your Facebook user. Press Authenticate button, follow the steps and grant our app all requested permissions. As soon as your Facebook user is authenticated a " Send posts to" option will appear. In drop-down, you will see a list of Facebook pages and groups you can make posts to. You can select only 1 posting destination if you have Basic membership, and up to 3 - if you are on a paid membership. Same posts will be sent to all selected destinations simultaneously. Please use "Search" option if you have a long list of pages and groups. If you can't find any of your Facebook groups on the list, it is more likely that you haven't added our app to these groups. See quick tutorial on how to add RSS Ground app to your Facebook group. Finally, you set a posting interval - how often you wish to make posts. The minimum interval size you can set depends on your membership level: from once in "every 24 hours" for Basic level, to "every 30 minutes" for Business level. 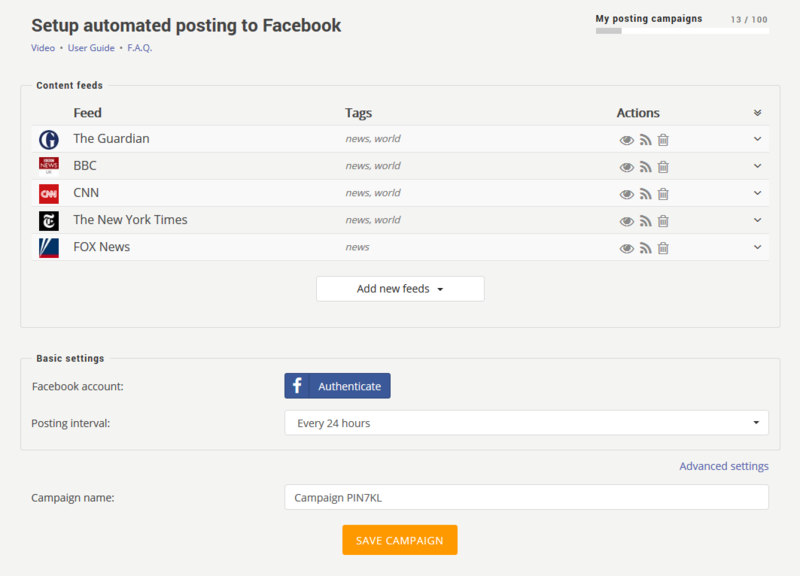 All your Facebook posting campaigns are saved in "Posting Campaigns" section of MY ACCOUNT. 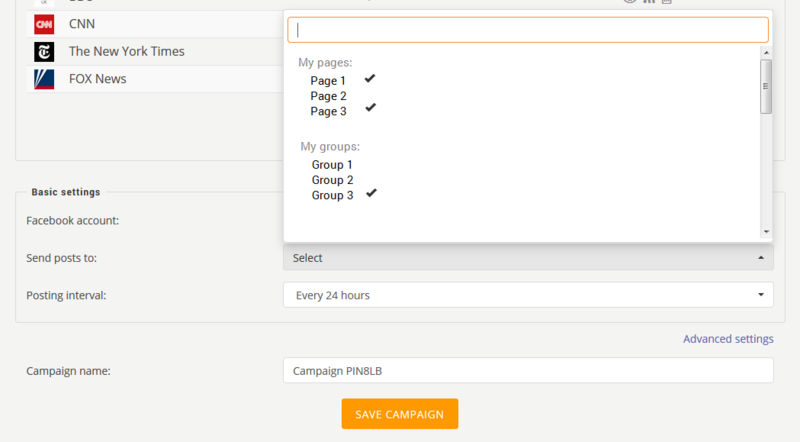 See our other user tutorial on how to manage your created posting campaigns. Only new - only content newly added after the previous campaign run will be posted. From newest to oldest - if there is no newly added content, most fresh but not yet posted content from the feeds will be posted. Randomly - a random content from specified feeds will be posted. If you wish to post only recent content to your Facebook pages or groups, you are recommended to use "Only new" option. If you wish to ensure the gradual update of your Facebook pages and groups, you are recommended to use "From newest to oldest" option. Post only items with these keywords - specify one or several content filter keywords. Only content which mentions at least one of the specified keywords in its title or description will be posted. Don't post items with these keywords - specify one or several content filter keywords. Content which mentions at least one of the specified keywords in its title or description will be excluded from posting. Add item title to post - this setting will automatically add content title to facebook post above post image; this can be useful for SEO purposes as an additional content to search for, and also, in case with Facebook content feeds, it will post additinal content from original Facebook post. 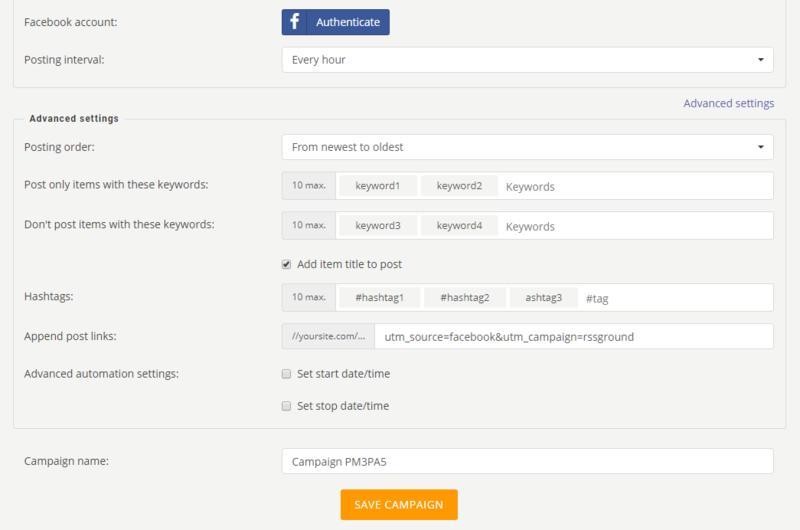 Hashtags - specify hashtags you wish to add to each of your Facebook posts. You can append not only link parameters, but also link fragments. If you add a fragment ( #your_fragment), make sure you enter it with hash symbol (#), otherwise, it will be counted as a parameter (&your_fragment). Number of items to post – this option was deprecated. Right now you can post only one item at a time.